Here are some very pretty villages/small towns to visit, with lovely, easy walks on the doorstep for moderate exercise afterwards. 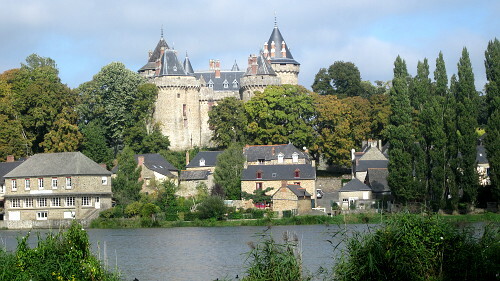 Combourg (Ille-et-Vilaine) After a visit to the famous château, admire the medieval architecture of this little town and then enjoy a stroll around the lake, given the name ‘Tranquil’ by the great writer Chateaubriand who spent his formative years here. St-Just (Ille-et-Vilaine) This small village contains La Maison Nature et Mégaliths, a good starting point for a walk on the lonely adjoining plain, where you will see one of the finest concentrations of megaliths – often unusual ones - in Brittany. Léhon (Côtes d’Armor) Hard to imagine a more beautiful village than this. Its idyllic setting includes an ancient abbey, ruined castle and river with old stone bridge. 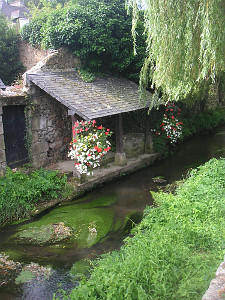 The Rance provides a simple walk along the towpath to Dinan, just a short distance away. 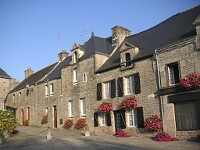 Jugon-les-Lacs (Côtes d’Armor) Tucked in a deep valley with lakes, rivers and forest, this historic village has an impressive centre with many granite houses from the 17th and 18th century. An important base for fishing, cycling and sailing, Jugon also offers plenty of scenic walking. Lizio (Morbihan) A charming village of mainly 18th century houses, with the extraordinary, unique attraction of the ‘Iron-working Poet’ not far away. Several walking routes including a botanical trail criss-cross a wooded river valley below the settlement. Ploërmel (Morbihan) A modest town not a village, but steeped in history which has left many architectural traces, even remnants of the 12th century fortifications and former ducal properties. The large Lac au Duc on the edge provides lengthy walking options, or just follow the 2km hortensia trail. Douarnenez (Finistère) A fishing town with glorious views over the Bay of Douarnenez, and the green oasis of the Plomarc’h ready for a peaceful stroll after a good lunch at the port. The route offers a farm with animals on view, picturesque old cottages and the important remains of a 1st century Roman fish sauce factory. 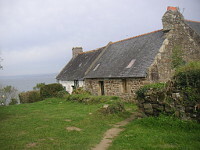 Le Conquet (Finistère) Gateway to the Atlantic islands if you want to take a boat and stroll around little Molène, but there’s plenty of fantastic coastal and estuary walking to be had right from the village, which is well worth a look in its own right.